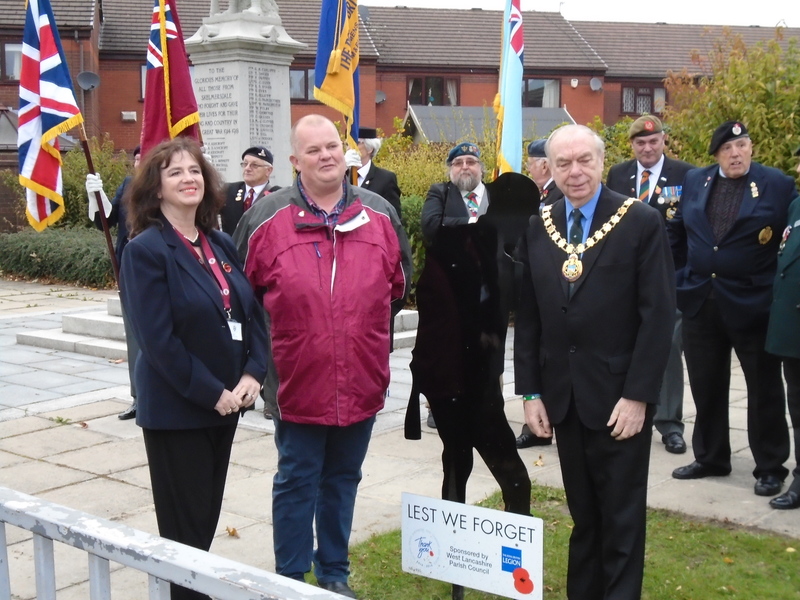 West Lancashire Borough Council is working on its tributes to those who served in the armed forces as it joins others across the country to mark the 100th anniversary of the end of World War One. The Council has bought three ‘Silent Soldier Silhouettes’ from the Royal British Legion which have poppy emblems and a base plate plaque with the text ‘1914-1918’ and ‘Lest we forget’. Two of these have been placed at the war memorials in Skelmersdale and Burscough, and a third will be placed by the memorial in Ormskirk in time for Remembrance Sunday on 11 November 2018. The Borough Council will also be cleaning its memorials and has worked with Up Holland Parish Council to re-gild the name plaques on Up Holland War Memorial. Around the time of Remembrance Sunday the Clock Tower in Ormskirk and the Light Cube in Skelmersdale will be coloured red and white to show wider community respect for the commemorations. On Remembrance Sunday, 11 November 2018, a piper’s tribute will play ‘When the Battle’s O’er’ in Coronation Park, Ormskirk at 6am to mark the time when the Armistice was signed 100 years before. Veterans’ organisations, the Borough Council, and a number of Parish Councils and local churches will be organising Remembrance Sunday Services during the day in Burscough, Ormskirk, and Skelmersdale and across West Lancashire. Then in the evening a beacon will be lit in Beacon Country Park at 7pm as West Lancashire joins more than 370 Councils and 1,000 beacon sites across the country in this collective act of respect and recognition. Prior to the lighting of the beacons at 6.55pm the Last Post will be played at venues across the country. For more details of events and World War One commemorations visit the new page on the Council’s website www.westlancs.gov.uk/ww1. The Borough-Council owned Chapel Gallery is hosting a World War One Heritage Project recognising the role of Women during World War One, focusing on a number of women with strong links to West Lancashire. The Council has been successful in securing funding from Heritage Lottery to develop this in partnership with Edge Hill University and Ormskirk and District Family History Society. The exhibition “Opening the Gates”, will involve local schools and is planned to run until 19 January 2019. The popular War Horse Walk leaflet has been relaunched and is available from the Council Offices, the Customer Service Point at the Concourse Shopping Centre, Skelmersdale, Ormskirk Library and can be downloaded from www.DiscoverOrmskirk.com.